Pentair X-Flow (standard) compared with Helix. Pentair reports that the flux enhancing Helix technology allows for much higher productivity by optimising long-term membrane performance. It does so by preventing the build-up of foulants, which traditionally reduce the hydraulic permeability of membrane systems. The uncontrolled build-up of insoluble foulants/particles increases energy consumption and decreases overall performance. The common answer until now was to step up the crossflow velocity, leading to higher energy consumption. 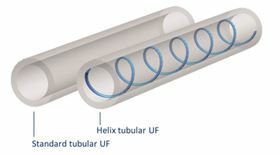 Helix effectively resolves the most important performance bottleneck in high-solids ultrafiltration (UF) by bringing constant turbulence right to the membrane wall. Flux decline in any filtration process is caused by concentration polarisation and fouling, with the solute accumulating to eventually form a cake layer. The introduction of helically winding ridges delivers enhanced mixing and thus significantly reduces this formation of solids, even at low crossflow velocities. With this ongoing cleansing process, more permeate can flow through the membrane without additional energy demand. According to Pentair, combining high turbulence with low energy consumption, Helix can deliver up to 100% extra productivity and reduce energy costs by 50%, depending on the feed water characteristics. The new Helix technology is available on all X-Flow tubular (Compact) membranes. The latest addition to this product range is the 12 inch diameter Compact 75G, a glass fibre-reinforced epoxy module with high mechanical strength and high chemical resistance. The Compact membranes were developed for the most demanding wastewater applications in the food and beverage industry, refineries, petrochemicals, automotive and produced water treatment in the oil and gas industry.